Former Atlanta Falcons player Michael Vick stands on the field prior to the game against the New Orleans Saints at the Georgia Dome on January 1, 2017 in Atlanta, Georgia. 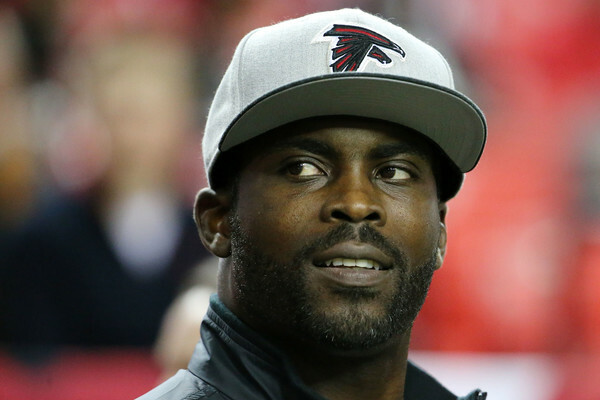 *NFL quarterback Michael Vick is hanging up his cleats. The 36-year-old has revealed his official retirement from the NFL by way of a flyer announcing his “official retirement party” on Saturday (Feb. 4) at Houston’s Grooves nightclub as a part of the city’s Super Bowl weekend. Vick’s co-host is rapper Gucci Mane, who posted a video on Instagram explaining the party’s details. Vick entered the league in 2001 after winning the Heisman Trophy during his college career at Virginia Tech. During his time in the NFL, Vick was a 4-time Pro Bowler and played for the Atlanta Falcons, Philadelphia Eagles, New York Jets and Pittsburg Steelers. His career was nearly derailed in April 2007, when he went to prison for running an illegal interstate dog fighting ring that had operated on his property for five years. In August 2007, Vick pleaded guilty to federal felony charges and served 21 months in prison, followed by two months in home confinement.